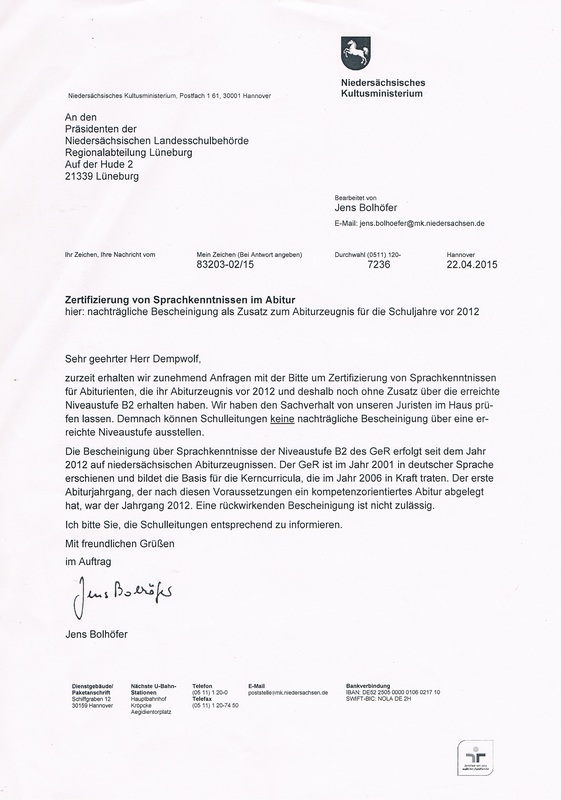 Berufliches Gymnasium Empfehlung: Pruefungsgutachten ab Abitur 2017 in Verbindung mit Excel-Datei "Berechnung der Abiturnote"
Berufliches Gymnasium Excel-Datei: "Berechnung der Abiturnote"
Berufliches Gymnasium Materialien zur Überprüfung der Kompetenz "Sprechen"
This study mirrored the French as a Foreign Language Study and took place at the same time (with data collection also in 1971). It employed a similar test of reading, listening, writing, and speaking. The objectives of this study included - an examination of the place of English in the educational system - an examination of the relationship between level of achievement and characteristics of the student, teacher, school, and the country - an analysis of errors made by students in responding to the test in order to obtain a grater understanding of how students learn English. Key Findings are given as well as major publications and a Link to the Study website. Strictly speaking, energy is stored not only in molecular movements and vibrations but also in the transition between physical states. During evaporation and condensation, water absorbs and releases a relatively large amount of energy owing to the strong hydrogen bridge bonds. Information and ideas: As background for the topic water as a means of energy storage and water in power generation , which is also important for thermal power engines, such as the steam engine. Even without going into thermodynamics, it is clear where steam engines get their energy from: The superheated steam contains a great deal of energy. Given the same volume, this corresponds to a high pressure that can move a piston. The Ear, Hearing and Hearing Impairment - How does screen reading software work? Questions are: Where else could such software be used? What are the benefits for various users? How does screen reading software work? What does this have to do with speech and speech synthesis? How does the historical ;speaking machine differ from the computer program? Information and ideas: Software of this kind is increasingly being used by young people as well. The paper thus covers a relevant topic and could be used as a basis in lessons ranging from language to information technology. Human speech mainly uses frequencies between approx. 300 Hz and 3,400 Hz. Depending on loudness and gender, the weighting shifts more to deeper (whispering, men) or higher tones (talking loudly, women). Strictly speaking there are, however, always deeper tones to approx. 100 Hz and higher ones to approx. 10,000 Hz, even in speech. If these tones are missing, comprehensibility may be affected. Information and ideas: An understanding of these aspects is a prerequisite for telephone, radio, cell phone and hearing aid technology. Englischsprachige Länder sind klassische Einwanderungsländer. Bei Großbritannien und den USA hat dies vor allem mit ihrer Geschichte zu tun. Australien, Canada und die USA sind Traumländer für viele Europäer, die sich nach unendlichen Weiten und unverdorbener Natur sehnen. Durch ihre wirtschaftliche Stärke und ihr Entwicklungspotential sind sie vor allem aber das Ziel einer Vielzahl von Menschen aus der dritten Welt, die sich dort bessere Lebens- und Arbeitsbedingungen erhoffen. Ein Projekt des GK 12 des Erich Kästner Gymnasiums. A Virtual Village, created by Peter Gottschalk and Mathew Schmalz and housed at Wesleyan University, takes us to an Indian village in the northeast Indian state of Bihar, given the fictional name of Arampur (to protect the privacy of its residents). Interactive technology invites visitors to wander through the village using maps containing links to places and people. In 360-degree panoramic views, we visit temples, mosques, and shops; observe everyday village activities like eating, shopping, carrying wood, going for medical help, and visiting shrines; and listen to people speaking about their lives in the three languages of the village, Hindi, Urdu, and Bhojpuri (with English translations). In New York hat sich in den letzten Jahren eine „yiddish speaking community “ gebildet. Im Stadtteil Brooklyn gibt es viele Konzerte jiddischer Popbands, jiddische Lesungen oder jiddische Stammtische. Jiddisch entwickelt sich in New York zu einer Identität stiftenden Alternative zu Englisch oder Hebräisch. The project dealing with the development of a basic Russian course online is already in its advanced stage. The 12 learning units have been created. The partners have recently recorded the texts and dialogues of the learning units. They will soon be programmed and uploaded on the e-learning platform. The course material is structured in such a way to ensure as far as possible acquisition of both productive and receptive skills. Each unit consists of 4 main parts. The first is 'How to say it in Russian?' This part introduces language patterns, main vocabulary of the unit and grammar structures integrated in the learning content. The second part 'Listening and Reading' works on consolidation of the material introduced by practicing listening and reading skills. It is followed by the 'Listening and Speaking' part, which simulates various communicative situations through answering and asking questions, completing phrases, etc. The fourth part 'Exercises' provides language practice through interactive drills and concentrates on writing, listening and reading comprehension. Talk a Lot is a great new way to learn spoken English. Instead of spending hours reading and writing, students have the opportunity to engage in challenging and fun speaking and listening activities with their friends. On this course students learn how to think in English as well as Talk a Lot! Spurensuche presents 20 topics that are important to the German-speaking communities in Chicago and the Midwest. This website is meant to be an interactive guide to further explorations of these topics. The study investigated factors associated with the learning of French as a foreign language. Tests were developed to assess performance in reading, listening, speaking and writing. Two types of writing tests were used. The first could be reliably scored, being of an objective or quasi-objective nature. The second involved directed composition. The data were collected in 1971. Key Findings are given as well as major publications and a Link to the Study website.